Some times I have to be reminded why I first came to Guatemala. This morning was one of those times. It seemed like a weeks work piled up on me when I went to Saloma for 2 days. When I got home last night it took me 4 hours just to catch up on Answering e-mails and returning phone calls that I had missed in the past 2 days. I then stayed up until 2:30 am getting caught up on my journal. When I finally drug myself out of bed at a rather late hour this morning I had some new e-mails that presented a few other issues that I had to deal with so I barely made it out of the door before noon. I was watching the clock closely because I knew that if I stayed home much longer the kids would be out of school and at least a half dozen of them would be begging me to take them along. I really didn’t want to deal with that because I wanted to meat with a few people from Hermano Pedro with out any interruptions. Besides that I have kids with me almost 24 7 and it is nice to have a break every now and then. On my way into Antigua I was still trying to schedule a bunch of things in my mind and drive at the same time. Anyone who has ever driven or even ridden in a car here in Guatemala knows that when you are driving a car you have to put 110% of your concentration into your driving. 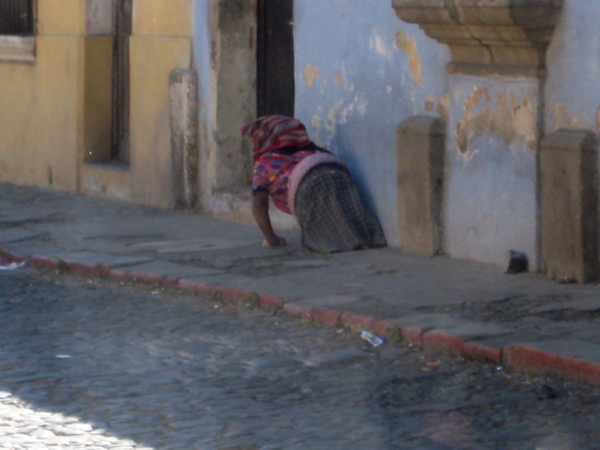 Perhaps that is why when I drove by a lady that was dragging herself with her hands down the sidewalk at the outskirts of Antigua I scarcely paid any attention to her. 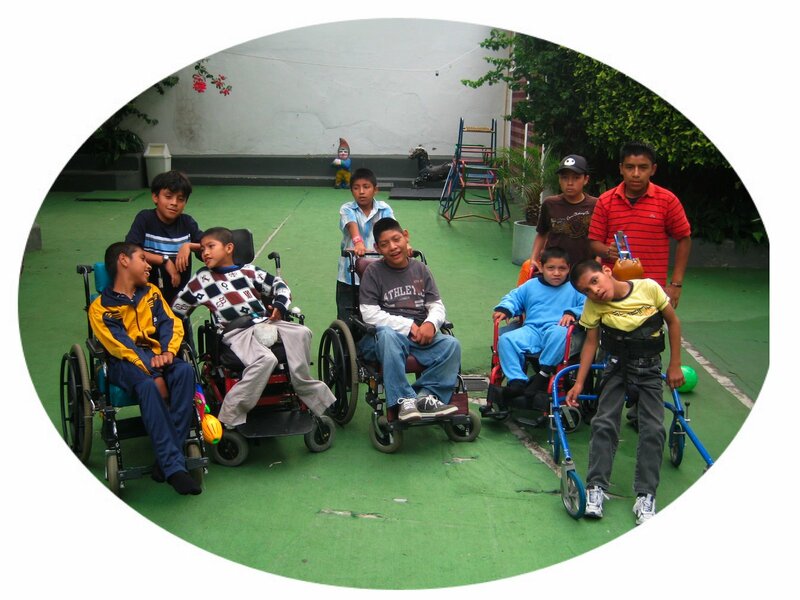 However about a block further down the road it dawned on me that one of the primary reasons that I came to Guatemala was to share the love of Jesus by helping to provide wheelchairs to those that truly needed them. There was no doubt in my mind that this lady could use a wheelchair. As I kept driving a lot of reasons not to turn around and go back ran through my mind. One of them was that I was on a one way street. There was no way I could turn the car around and go the wrong way down a one way street. I must admit this excuse didn’t hold much water. So many people in Guatemala drive the wrong way down one way streets that it is impossible to know which way the cars are suppose to be going if you look at the traffic. I also reminded myself that there are thousands of people in Guatemala that need wheelchairs and we can’t possibly give wheelchairs to all of them. I also had a lot of things going on today and I didn’t need anything else added to my schedule. Besides that after thinking through all of these reason not to go back I was a good 6 blocks down the road. Besides that there are a lot of tourists in Guatemala, surly one of them would offer to help her out. Although judging by her appearance so far no one had. But even if I turned around chances were this lady had already gone inside one of the many buildings that lined the street and if I happened to find her there was this thing that I have about not knowing the language. Suppose I did fined her would I have to do another pantomime to try to get her to understand what I was talking about? Although I must admit after this many years of surviving without knowing much of the language my pantomime skills have greatly improved. Ever have those times when even though you come up with dozens of great excuses why you should or should not do something you still can’t convince your self? Don’t you just hate it when that happens? When I finally turned the car around I was a good ten blocks away from where I had seen the lady dragging her self down the side walk. I actually had to drive a lot further than that because no self respecting Guatemalan would ever drive more than just a few blocks in the wrong direction down a one way street, so I actually tried to go a block over and then back. However the street workers had put up some barricades so that they could repair the road and I ended up zigzagging all over Antigua. I had doubts that I would find this lady back but knew that my conscience would not rest if I didn’t at least give it a try. Finally I found myself back on the street where I had originally seen the lady. There she was not even a hundred feet further down the side walk then where I had first seen her. 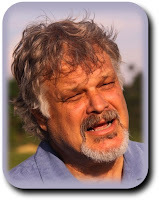 I had driven over 20 blocks while she had gone less than a hundred feet, and even though I had done it in the comfort of my car I had likely done a lot more grumbling and complaining than this dear lady had done in years. Was it a GODINCIDENCE that just when I got out of my car and walked up to her an American who knew both English and Spanish walked by. Considering about half the people in Antigua are foreigners who are studding Spanish you could possibly say that it wasn’t but I believe that God often works through very normal circumstances that come along and if we are available they are still as much of a God Thing as some of the things that I have seen that seem to be down right miracles. After a wonderful visit I discovered that this dear lady has a wheelchair but from what I could understand it either needs a lot of work or has to be replaced. 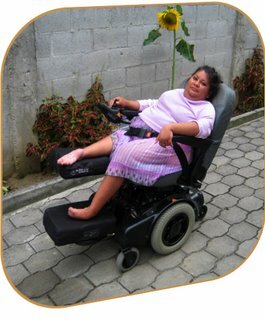 Either way she promised to get in contact with Bethel’s wheelchair shop and get the help that she needed. Funny thing is something that I almost considered a bother made me forget what ever it was that was on my mind that was trying to ruin my day. The fact is this inconvenience ended up making my day and so did the kids at the orphanage and the 12 to 15 that were in my house tonight. Isn’t it funny how the things that we try to avoid are often the things that are best for us? I had to get my car fixed again today. Nothing serous, I only had to get a few exhaust brackets replaced that were torn off wile I was in Saloma the other day. They actually have paved streets there but it seems that some of the steel grates that cover the drains in their streets are missing. The drains are about 3 feet square and bottomless. I guess one of the 2 times that I missed seeing one of them it must have broken the brackets when the wheel of my car dropped in. It cost me a whopping $12 but at least now my exhaust is fixed. I considered asking the mechanic if he could do anything about my bent wheel but I figure that I have a 50 50 chance that the next time I hit another pot hole it will straiten the wheel back out. After leaving the mechanic I headed to Hermano Pedro. 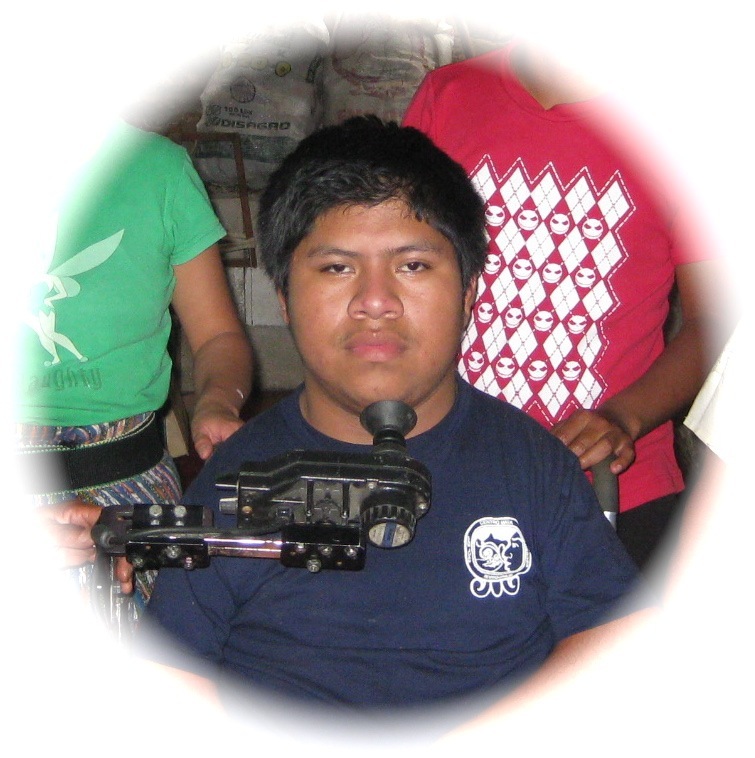 I had promised Carlos that I would fix a problem that he had with his power wheelchair. I may have been able to get it done in less than an hour but I had lots of little helpers because many of the kids are starting to come back after spending the Christmas holidays at home. Ervin is now back and unfortunately has not gotten any better at not screaming his head off when ever things do not go his way. He is a really neat kid but if he keeps this up he will soon once again be avoided by most volunteers. I wish that he would realize that by doing this he gets even less of the attention that he wants and needs. Most of the other kids that are back have not changed much. Some have lost a bit of weight but not to much. One of the girls came back quite sick and was found to have hepatitis. Moises just got back today and was having a bit of a hard time after his father dropped him off without hardly saying goodbye. At around 3 PM I finished up on Carlos’s wheelchair so I decided to take Moises out for a hamburger. Even though I had something to eat a few hours earlier I could see that there was no way that I was going to get out of feeding the kids in my neighborhood tonight. I only lost one when I announced that tonight each one was going to help with the cooking or with cleaning up and their payment was going to be tonight’s meal. Needless to say after the last dish was washed and put away Abner, who was the one that didn’t want to help, announced that he was hungry. Needless to say I announced to him that he was going to stay that way until morning and that it would be his turn to do dishes then. He did remarkably well with it though and didn’t go into a 3 hour crying spell. Abner is slowly becoming a pleasant young man, most of the time. It’s just those other times that he can still drive you crazy. I love him though and thankfully I don’t have to remind myself of that nearly as often as I used to. Well it is time to ask my 15 dinner guests to leave and head off to bed. This morning Benjamin joined me for a 2 day road trip. Christopher, who lives in San Francisco a small town near Xela, has been without his power wheelchair for several days. It has been at our shop for repairs. Without it Christopher can not go to school unless his mother caries him down the trail that leads from there house to a road and then pushes him to school in a manual wheelchair. We also needed to get more medicine in to Erica, the girl that has the skin disease, and some bed sore medicine to a young man who is having a problem with bed sores. The drive from Chemaltenango to Xela can sometimes be done in around 3 hours. Sometimes but not today. For the past few years now there has been a lot of road construction taking place on the Pan American highway that leads to Xela. It will be a big improvement when and if it ever gets completed but right now it is a big mess. Signs telling you where detours are or which lanes of the rode suddenly narrow down or worse yet still have no bridges over rivers and ravines, are virtually non existent so you have to continually be on guard for what ever lies around the next corner. There are some places where they have flag men trying to stop traffic but those places are not much better. Much like the situation that I ran into last week end, these flag men stop traffic for up to 2 hours at a time. The only diffrance is that the road that I was on the other day only sees a few cars a day on it, but the Pan American highway is filled with Busses, trucks, and cars, and not all of the drivers have a great deal of patience. There is always someone who decides that they will squeeze there way to the front of a mile long line that is waiting for the road to open up by passing all of the stopped traffic in the oncoming lain. It is usually the busses that do this but once they do they are often followed by a number of cars and trucks. With out fail they are met on some narrow corner by one of the gravel trucks that is working on the road or by another buss, that is being followed by a dozen or more trucks and cars, who had also decided not to wait until the flag man reopened the road. Seeing who gives in and which procession is willing to back up for a mile or so can be a real comedy. I must admit that sitting on the fender of your car and watching this helps relieve the boredom of a 2 hour delay. We finally made it to San Francisco (Guatemala not California) at just past noon. We then hiked in to Erica’s house with the medicine that she needed. She is doing quite well and her face, arms, and upper body, although still not totally smooth, are free of the thick black crusts that once covered them. Her feet and legs however once again looked like they were covered with rotting leather. Her mother told us though that the medicine was a God send and that Erica seemed like a new person. She said that the thick crust on her legs occasionally come back but over all Erica is doing well. Erica’s older sister is still home schooling her and Erica loves it. Before leaving Erica’s mother brought us out a big lunch. Neither Benjamin nor I were very hungry because we had stopped off for something to eat about a hour earlier. We ate all that we could though because we knew what a sacrifice it was for this family to offer their food to us. On our way out from Erica’s house we hiked up to the edge of the cliff where Christopher lives. Christopher and most of his relatives have all moved back into the houses that did not disappear over the cliff during the heavy rains of Hurricane Stan 2 years ago. Some of the homes that they moved back into are literally at the edge of the cliff but the people have no where else to live so in spite of the danger they have return to homes that were not destroyed or to those that only had one or 2 rooms disappear over the cliff. Christopher was not at home when we arrived but we were told by some relatives that he and his mother would be returning soon. Since we knew that they would be coming up the trail that led to our car we decided to head out and meat them. Sure enough about half way back to my car we met Christopher, his mother, and brother and sister coming up the trail. 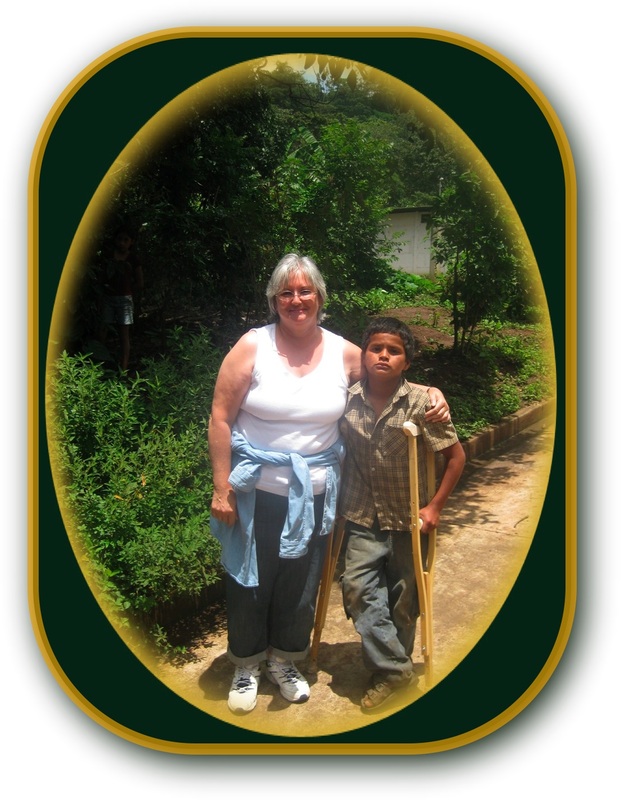 Christopher’s mother who is a small lady was carrying 13 year old Christopher on her back and his younger brother was carrying his wheelchair up the narrow trail. We stood there and visited for a while and then we all headed back out to my car to get Christopher’s power chair. Christopher was verry excited to get his chair back because now he would be able to go most of the way from his house to school under his own power. 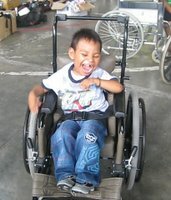 I think that his mother and Brother who had been carrying Christopher and his wheelchair were equally as happy. After unloading Christopher’s wheelchair from the car we noticed one broken part that had been over looked at the shop but fortunately I had my tools with me and even though I did not have the needed part I was able to improvise and the wheelchair should now be fine until our next visit. Christopher’s mom told us that the doctor thinks that the mass that is located just above Christopher’s brain has been there since birth and is not growing so they have decided not to operate. Christopher has not had any seizures for quite some time now so I am praying that they are right. I know that if he was someone who was living in the USA his family would likely have a lot more tests done but here in Guatemala it is not all that simple and not many families have the resources to take there children to doctors or anything other than a government hospital that many of the people consider nothing more than the place that you go to to die. I was glad though that the seizures have stopped and that Christopher’s over all health looked much better than it did the last time that I saw him and I pray that he continues to stay healthy. Far to many children that I know have died within just this past year. Our next stop was at the home of a young man who we gave a wheelchair to at our last distribution. I had promised that the next time I was in the area I would drop off some bed sore medicine. Unlike our visits with Erica and Christopher this family was not overly friendly to us. They thanked us for bringing the medicine though and then we were quickly on our way. Tonight we are in Mazatenango at the Bamboo Motel. Other than the cement beds this is still one of my favorite motels. The rooms are nice, the food is good, the prices are right, and they even have a swimming pool. After putting on our swim suits and getting to the pool we discovered that the filtration system has been broken for a few days so it was more like swimming in one of the local ponds but it still felt good and a quick shower afterwards got rid of most of the crud that had built up on our skin while swimming. Well I am getting tired enough that I think I can fall asleep even if it is on a cement bed that has a 2 inch piece of foam rubber on it, so I am once again going to say goodnight. After breakfast Benjamin and I headed east towards Ronny’s house. Once again this normal 2 hour drive proved to take much longer. Much like where we were yesterday there is a lot of construction taking place on this highway as well. If they ever get all of the construction completed the highway system should be a lot better and taking into account that many cars and buses are having accidents and being destroyed during the construction there should be far less traffic on them as well. Travel on the roads that have no construction on them is not much faster because of the sugar cane trucks that are on them. Not only do they move very slowly when loaded but the loads that they carry often hang way out over the top and sides of the truck and you have to be extremely careful when passing or meeting one of them. Ronny’s parents told us that since Ronny knew that we were coming he had wanted to stay home from school but they convinced him to go. Actually I don’t think that he had much choice because his power wheelchair was once again having problems so his mother had pushed him to school in his manual wheelchair. Both he and his brothers and sisters are doing well in school though and they really seem to enjoy it. Ronny’s mother told me that 6 year old Arlindo is so thrilled that he can now go to school that he is always out of bed and cleaned up for school by 5:30 AM. At around noon Benjamin and I walked to the school along with Ronny’s mom. School was not quite over yet but knowing how eager Ronny was to see us his teacher let him out of class a bit early. When we got back to Ronny’s house all of the kids showed us the school work that they had been doing. Seeing how much they love school makes it hard to see so many kids not going simply because they don’t have enough money for school supplies. Ronny was delighted that we were once again able to get his power wheelchair going because I had originally told him that I possibly would have to take it back to the shop with me for a few days. I am praying that it continues to work for a while but bumpy trails and the dust and mud seem to take a high toll on power wheelchairs. We stayed quite a long time just visiting after we had repaired the wheelchair. Ronny’s entire family is extremely eager to get into there new house. Some local brick layers that we have hired have gotten a good start on it but we are leaving the rest for when the group from the USA arrives in a few weeks. After leaving Ronny’s house we briefly stopped of at Angelica’s house to see how she was doing. She was happy to see us and quickly showed us that she is now starting to walk a bit and the operation on her femur seems to be a success. While we were at Ronny’s school I talked with Ronny’s teacher about the clinic that she had taken us to that was in her town about a year ago. She told us that even though they had verry little money to keep it going it was still operating and that they were seeing about 50 people a day there. The teacher met up with us at Angelica’s home and we then drove to her town to once again visit the clinic. 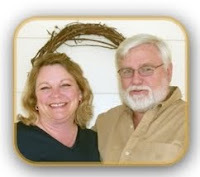 The administrator and doctor at the clinic immediately recognized me and asked where I had been for the past year. They showed me the pictures of several people that were in need of wheelchairs and asked if we could help. I told them that I would bring them some wheelchair forums soon and we would try and get these people in to a wheelchair distribution. I asked them about one little boy Who’s picture they had shown me the last time that I was there. He had stuck in my mind because he looked so skinny and it appeared that he was dying. They told me that since he was nearly an hour from the clinic that they simply had not had the opportunity to follow up on him but feared that he had died. After just hearing about the 2 kids that died when I was in Rabinal last week I just could not wonder though. What if he were still alive and what if something could still be done for him? I am quite certain that Antonio would still be alive if only we could have gotten him the help that he needed in time. I asked the doctor and the administrator of the clinic if we could go and see if this boy were still alive. They told me yes and that all I had to do was pick the day. I quickly picked it. 15 minutes later the doctor, the clinic administrator, Ronny’s teacher, Benjamin, and myself were heading off to where Julio lived. Julio’s home was nothing more than some rusty tin nailed to some boards. It didn’t look like the family would be much wormer or dryer in it than they would be if they lived right outside. Mother, father and 4 other children were there but I did not see Julio. After the doctor introduced Benjamin and myself to the family he asked weather or not Julio was still alive. The mother nodded yes and took us over to the side of the house where a hammock hung between 2 trees. There in it was one of the skinniest children that I have ever seen. 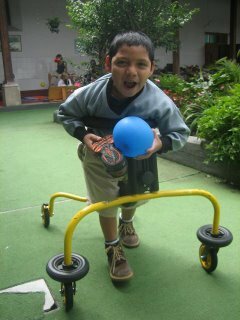 Julio’s mother told us that he has had diarrhea all of his life and any food that she ever gave him would go right through him. It was hard to believe that this child who had to weigh less than 20 pounds was 9 years old. To my surprise though he was quite alert and fairly limber considering he has spent his entire life lying in a hammock. It was obvious that his parents cared about him but with no money and 4 other children to feed they were unable to do much for him. Nor did they think that anything could be done for him. The only doctor that had ever seen him was the one that was with me. He had given him medicine for parasites but one look at the families water supply made it evident that even if the medicine had worked new parasites were in this child’s body with in days. 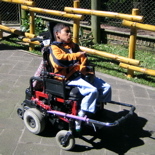 I am sure that the other children in the family had parasites as well but since Julio also had cerebral palsy it had taken a far worse toll on him. 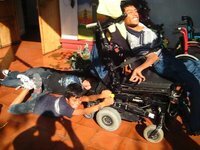 I told his parents that we gave out wheelchairs but that right now this was not a priority. We had to figure out a way to keep this child alive. The family had never met me before and to my knowledge had likely only heard stories about Americans. 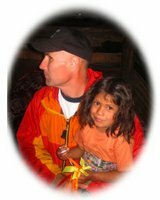 Unfortunately many of these stories are of Americans who want to kidnap their children or offering to take them to hospitals where the children either die at or simply never get returned to there homes. Never the less all I could do was try. I was grateful that the Cuban doctor, and 2 Guatemalan adults were along, perhaps this would ease the minds of 2 nervous parents. I will not go into detail about the conversation and exactly what went on but I consider the decisions that Julio’s parents made to be a real God thing. Tonight Julio, his mother, and baby sister are all staying at Casa Defay in Antigua. Tomorrow morning at 6 AM I will pick them up and take them to Hermano Pedro where we will see if we can get him admitted into the malnutrition ward for a few months. 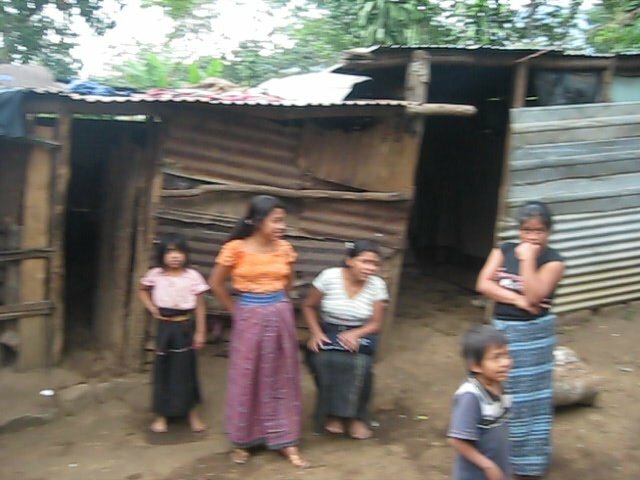 This is not always an easy process but I am convinced that if God made it possible for a Guatemalan family who had never seen a white man, to allow their child and the child’s mother to get in a car with 2 white people and go to a hospital that they had never heard of, that God will make it possible for Julio to get admitted into malnutrition. I was awake before my alarm went off at 5:20. No I hadn’t gotten as much sleep as I had wanted but I was excited to see what doors God was going to open for us to day. Julio’s mother was waiting for me when I got to Casa Defay. I could tell that she was nervous but there was no turning back now. Nor do I think that she would have changed her mind even if she were given the opportunity. She knew that with out help her son would soon be dead and knowing this she was ready to do anything even if it was perhaps one of the scariest experiences that she had ever encountered. Even though it was only 6:30 when we arrived and the offices of Hermano Pedro did not open until 7:00 there was already a long line up of people waiting to see the doctors. I went over to the children’s ward and got some blankets because the morning air was cold. Then we patiently stood in line and waited. Mother was holding her daughter and I was holding Julio. I feared that perhaps we should have showed up earlier because there are times when the doctors can not see every one that comes there. A few minutes before 7 a lady showed up and started handing out numbers to the people that were standing in line. There were a lot of numbers handed out before she finally got up to where we were standing. 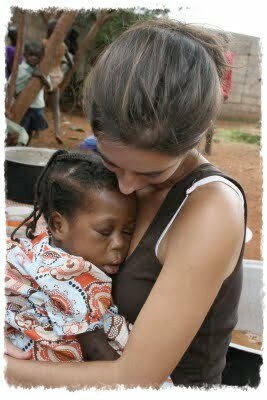 The lady looked down at the child that I had in my arms and motioned for me to follow her. She went up to the front of the line took out a key and opened the door to the office that had not yet been opened. As she opened the door she told us that she wanted Julio to be the first one to see the Doctor. I glanced at the people who had been in line in front of us knowing that they would perhaps not appreciate the fact that we were being allowed to go first but to my surprise they all looked down at Julio and then looked at me and nodded in approval. The paper work process still took about an hour but by the time we had finished we were at the door of the doctors office before it had opened and were the first ones to see the doctor when he arrived. After the doctor examined 9 year old Julio he laid him on a baby scale. 17 ½ pounds, and that was with a blanket that had to weigh at least ½ pound. 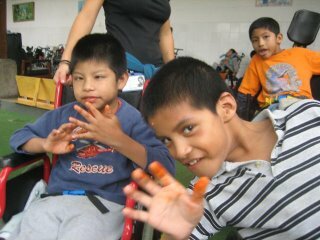 The doctor then asked Julio’s mother if she would like him to be admitted into the malnutrition ward. The mothers reply was an immediate yes. A short time later mother was saying goodbye to a cleaned up little boy who was lying on freshly laundered sheets in a warm crib. There were tears as she left but there was also a sigh of relief. The nurses promised mom that they would take good care of her son and encouraged her to come and visit when ever possible. We are praying that he will do well and possibly be able to return to his home with in as little as 4 months. 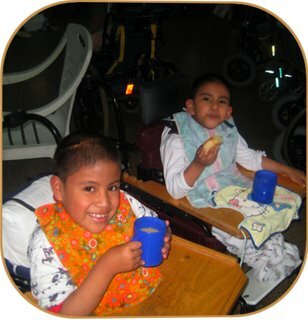 I am also planning on giving his family a water filter and I am going to check and see if there is a possibility of giving the family one of the prefabricated homes that should be arriving in a month or 2, but for now we are just going to concentrate on keeping this one child alive. I would love to end this weeks journal on a positive note but unfortunately there are far to many children who much like Julio need someone that is willing to reach out to them. On our way to bring Julio’s mother and sister back home this afternoon Jim, and Jill (2 friends from Antigua) and myself stopped off at the clinic in the town where Ronny’s teacher lives. I had some medicine and bandages that I wanted to give them. The doctor who had come along with us to Julio’s home yesterday had told me of another family that needed help. The father who’s wife had died had 2 boys of 4 and 7 years old. The 7 year old boy had suffered some brain damage when he had a severe fever at an early age. It was impossible for the father to care for his older son any longer because he had to work in order to feed his children and himself. He desperately wanted to put his older son into an orphanage, not because he did not love him but because he thought that it would be best for him. After meeting the boy I had to tell the father that I knew for a fact that Hermano Pedro would not take him. Why? Because he could walk. 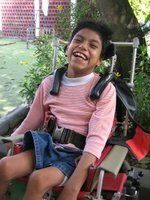 We promised that we would look into other places but had to be honest with him and let him know that the waiting lists were long and that it was next to impossible to find a place that would take a child with a disability. Basically we had to walk away saying goodbye to a father who was standing there with outstretched arms saying, “What am I to do?’ I hope to go back there when I can take someone along who is more fluent at Spanish. Perhaps if we can find some one who is willing to go in and care for the 2 boys while the father works we can help hold this family together. The only problem is we know of so many people who are in similar or far worse situations that it is difficult to know which one to help with wheelchairs, houses, or even our time. Please pray that God gives us real guidance and wisdom.